This is the first of a series of entries organized by Hannah Star Rogers, reflecting on the 2018 convening of the Helsinki-based Bioart Society. 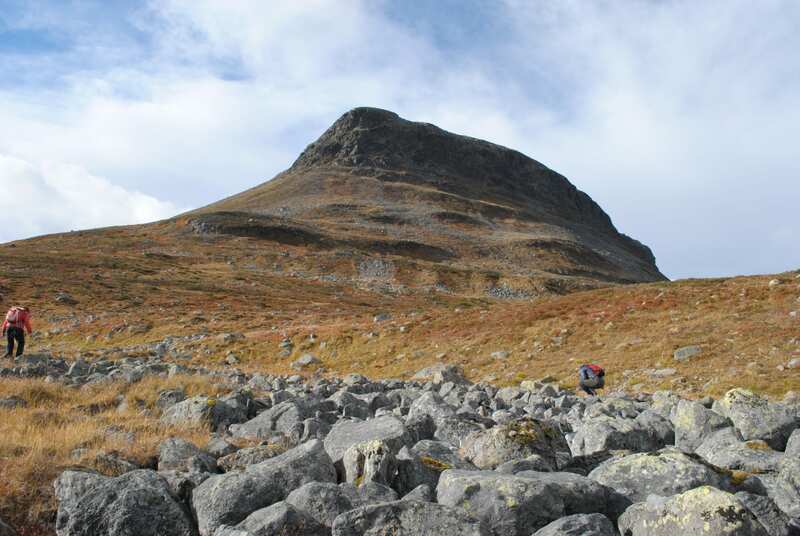 The Bioart Society’s Field_Notes meeting is held in the fall at the Kilpisjärvi Biological Station in far northern Finland. The Society brings together the expertise of artists, scientists, and humanists to explore the environment of Lapland and to consider a chosen theme. The 2018 gathering was designated “Ecology of Senses.” Each program includes a set of hosts who focus on a combination of themes and practices brought together by their group and individual expertise. As part of the 2018 Field_Notes, I hosted the “Second Order” group, tasked with observing and intervening in the work of the other groups. My research on art and science had included bioart, through interviews of practitioners and an ethnography of the labs at SymbioticA, but as early winter fell on Kilpisjärvi, I found a group of practitioners with a wide array of modes and methods that extended beyond traditional conceptions of bioart. 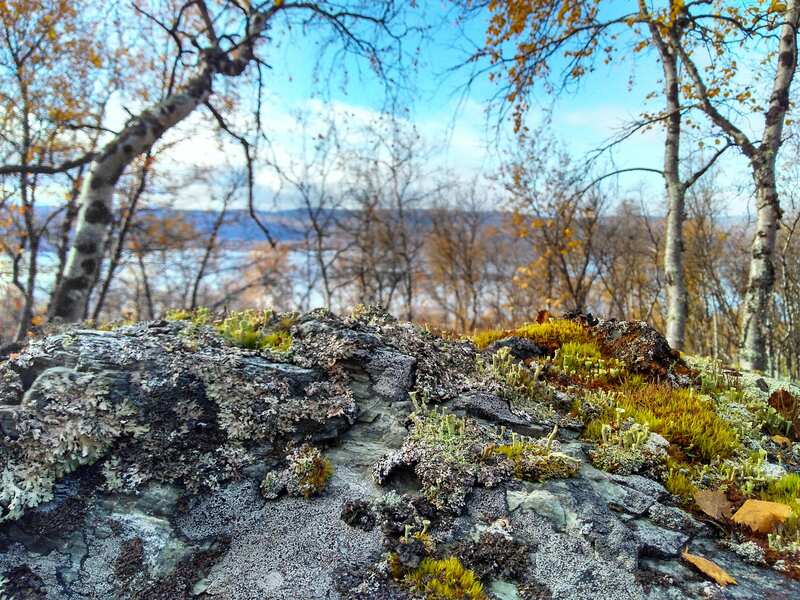 Moss and lichen communities on boulders at the bottom of Saana Fell, overlooking Lake Kilpisjärvi, 2018 (photograph by Hannah Rogers). In the last twenty or so years, there has been a remarkable proliferation of a distinct set of practices that are explicitly positioned as hybrid applications of the “worlds” of art and science. 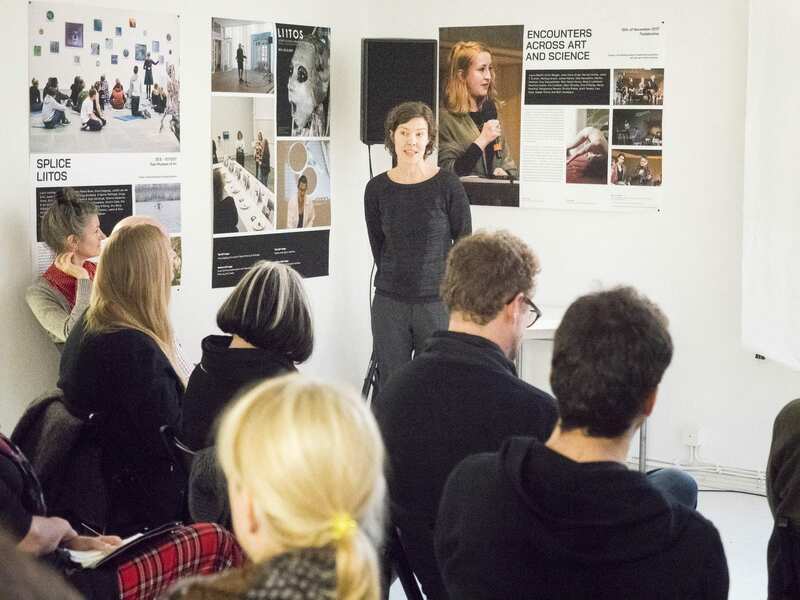 Any cursory read of international and domestic media coverage, gallery and museum documentation, and the web pages of university interdisciplinary programs (like the University at Buffalo’s Coalesce: Center for Biological Arts, and the Master’s in Art and Science at Central Saint Martins in London) reveal a rising interest in bringing art and science together. A focus on the institutions surrounding this upwelling of art and science work can offer a sense of the resources, motivations, patterns of production, and potential paths for new creators. Many of these art and science projects are intended to engage a broader public on pressing issues from a science or public policy perspective, while others critique contentious science or comment on the uses of science in our society; still others are primarily aesthetic without this accompanying political motive. A substantive number of exhibitions of art-science have focused on themes of contemporary social interest including genetics, biotechnology, and climate change.1 Galleries and museums are also forming with an explicit interest in these works, such as Singapore’s ArtScience Museum, which opened in 2011, and the Art/NaturSci Pavilion at the 2019 Venice Biennale. Art and science work has ranged from attempts to solve social problems by drawing on mixtures of art and science tools, to experiential artwork and novel visualization of natural systems and scientific ideas, to collaborations between artists and scientists that have yielded outputs corresponding to their individual domains. So promising are these attempts to form new configurations of expertise that they have attracted institutional support from the National Science Foundation grants for Exploring Science in the Studio, the Swiss international exchange program Artists-in-Labs (AIL), and UCLA’s ArtSci Center. A number of artist-run initiatives have formed over the past decade or so and operate as art-science collectives, self-organized groups that bring together individuals around a set of resources, often laboratories. They are often embedded in existing institutions, as in the University of Buffalo’s Coalesce: Center for Biological Arts Lab and the University of Western Australia’s SymbioticA, both of which have complete biological laboratory facilities. Also increasingly prevalent are public participation/citizen-science communities centered on community spaces for digital interventions, biohacking, and do-it-yourself biology experiments. Such organizations are often led by artist-scientist teams and have proven useful to artists who, like the public, often experience barriers to lab access. Community laboratories have been organized in many cities, and include Genspace in Brooklyn, MadLab in Manchester, England, and ASCUS in Edinburgh, Scotland. Art-science organizations with longer histories have been renewed by this period of interest in these activities. Founded in 1968, Leonardo/ISAST (International Society for the Arts, Sciences, and Technology) is a major hub for such activities, and the Ars Electronica festival, founded in 1979, hosts the foremost prize for art, technology, and society. Sam Nightingale and Saara Hannula work with film processing to produce cards for divination (photograph by Hannah Rogers). In 2016, the National Academies of Science (NAS) launched the first full-scale study of the effects of teaching art and design methods to science students.2 The comprehensive evaluation focused on the pedagogical benefits of integrating art and science, particularly in the context of bringing art into scientific curricula. The NAS sought evaluative measures to help to clarify the benefits of art in the STEM classroom. Such public policy initiatives and educational objectives encourage the move from STEM to STEAM and the hope that interdisciplinarity will have positive social, environmental, and economic effects. Putting aside the potential that this, in some cases, may represent an instrumentalization of arts for the purposes of science education or economic development, difficulties exist in assessing multidisciplinary practices precisely because the mode of assessment must take account of their divergent evaluative practices. To be sure, however, most art-science efforts seem to have less focused outcomes, and this can make them more difficult to assess. American funding bodies have been especially eager to set up standards to measure success. But such efforts present serious complications for documentation and evaluation, and close case studies of such efforts have revealed considerable challenges.3 This complicates potential alliances with funding bodies that hope for measurable outcomes. Even as efforts to calibrate the dynamics and assess the implications of art-science projects are ongoing in many quarters, what is meant by art and science in these endeavors is in question. It is not clear that stable or even coherent definitions of art and science are being used across these projects, and more observations of the use of these categories in practice work, particularly in hybrid organizations and projects, is in order. Artists and scientists working in these areas frequently do not report the delineations in their own experiences that appear in schemes of accounting for their efforts. Indeed, the history of art and the history of science have been deeply enmeshed to the point that it may be more useful to ask what is being accomplished through the use or breakdown on the boundaries between these areas, rather than to attempt to seat intentionally or unintentionally blurred work into a single camp. Moreover, most attempts to study this work have been in the form of visitor and audience surveys or analytical investigations of the projects produced by art-science endeavors. Less studied has been the influence of these experiences on artists themselves: how their work was impacted by these ideas, and what new works became possible through the exposures, connections, and reflections that such programs offer. 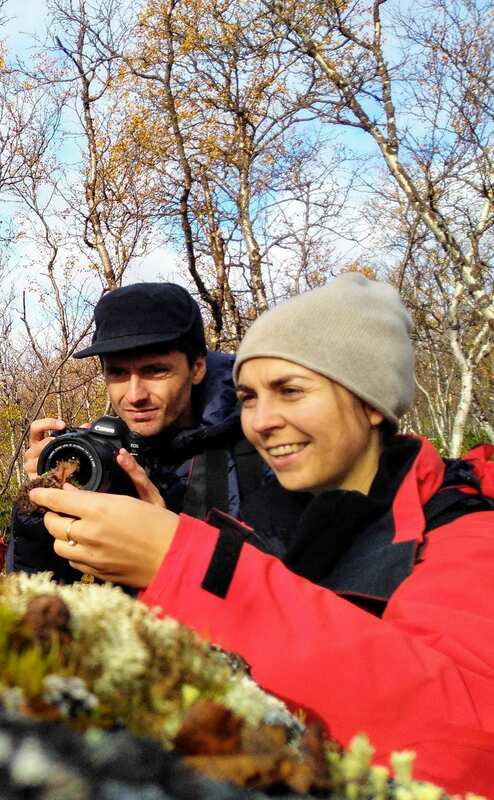 Christina Gruber and Paolo Patelli, member of Judith van der Elst’s “Surfing the Semiosphere” group, photograph moss and lichen communities on the boulders at the bottom of Saana Fell (photograph by Hannah Rogers). One organization, which now has more than 100 members from Finland and other countries, is the Bioart Society, established in May 2008 during a meeting of artists and scientists at the Kilpisjärvi Biological Station in Lapland, Finland. 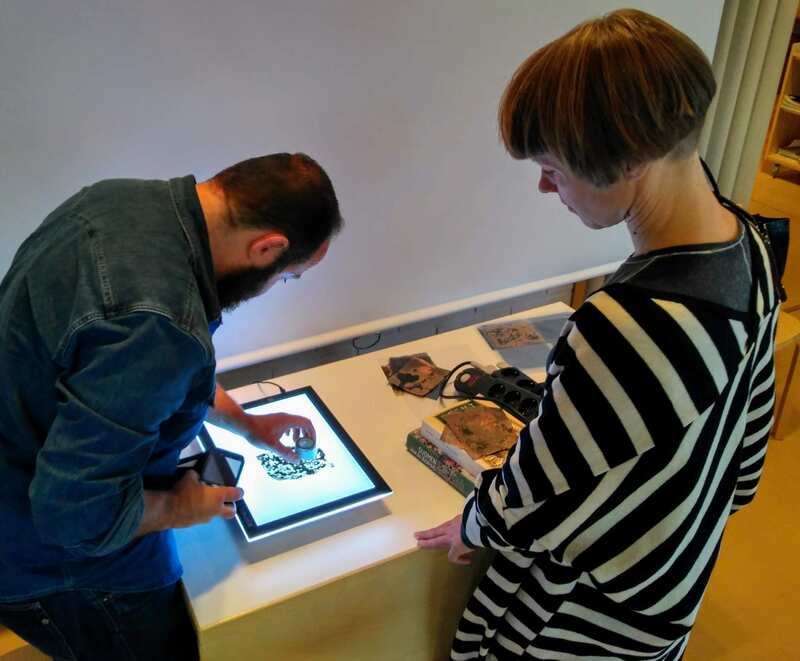 The Bioart Society’s primary mission is to provide the potential for artists to engage with science, and the Society’s base of operations, which has recently expanded to include a gallery space called SOLU, is located Helsinki. The Society develops, produces, and facilitates activities around art and natural sciences, with an emphasis on biology, ecology, and life sciences. Together with the Kilpisjärvi Biological Station of the University of Helsinki, the Society runs Ars Bioarctica, an art and science program with a focus on the sub-arctic environment. 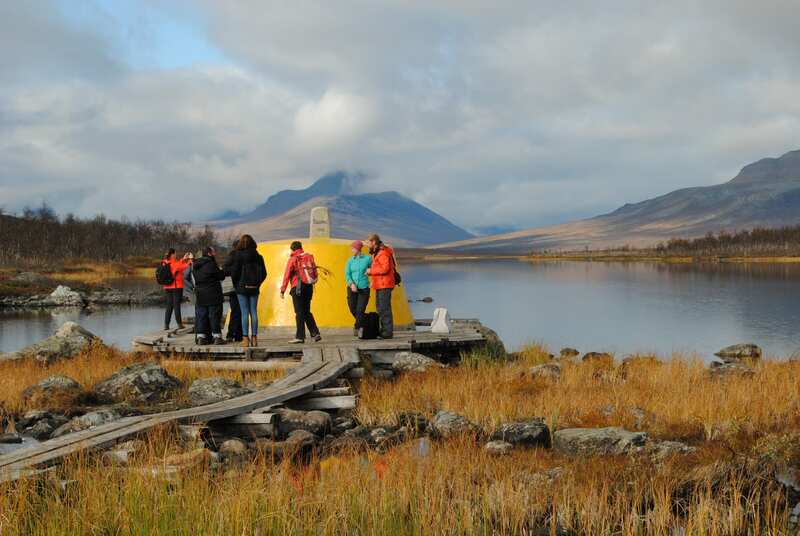 The Field_Notes program, first begun in 2011, brought international artists, scientists, and humanists to the station in September 2018 for a week to roam the environment, use the Kilpisjärvi Biological Station’s laboratory, collaborate in groups, and continue discussions from the previous Field_Notes. The 2018 theme was “Ecology of Senses.” I attended the program as the host of one of the five groups. This group, “The Second Order,” whose name was derived from Margaret Mead and Heinz von Foerster’s use of the term to describe a recursive application of theory, included Karen Elizabeth Bishop, Alice Smits, Taru Elfving, Shruti Sunderraman, Bilge Hasdemir, and Markus Petz, and was dedicated to observing the participants over the course of the week. We focused on observing and connecting with the other groups, with an emphasis on writing methods. Composed of curators, artists, humanities and STS scholars, and a journalist, the Second Order group observed and recorded other groups in the field and then met together to discuss and process our findings. What our group discovered was a plethora of methods and orientations toward the concept of bioart supported by an art-science organization with a focus on exploration. 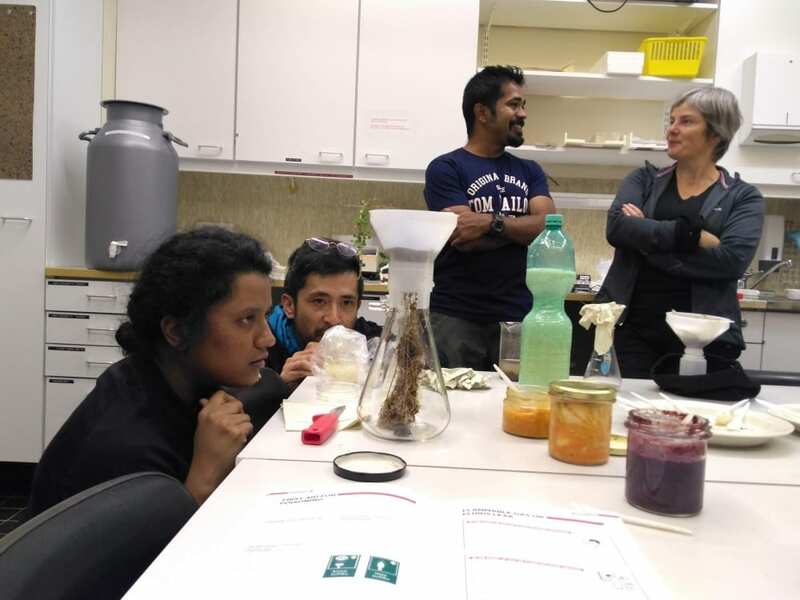 Aravin Chakravarthi and Toru (Ryu) Oyama of Marc Dusseiller’s HUMUS.Sapiens – Unveiling Hidden Micro Ecologies demonstrate their experiential work on the taste of soils to Heather Barnett and Shruti Sunderraman (photograph by Hannah Rogers). I believed that my previous background researching and curating bioart would prepare me for the proceedings, but I found a rather different version of bioart being created through the organization’s efforts. This bioart has roots in laboratory practice and an emphasis on living things as a medium, but also takes into account a broad range of other practices and theories, including ecological and land arts, instrumentation directed toward aesthetic means, the animal and non-human turns that have made their way across the humanities and social sciences, lived experience, and traditional landways. This is the first in a series of edited reports and reflections on Field_Notes that will appear in Art Journal Open over the following months. 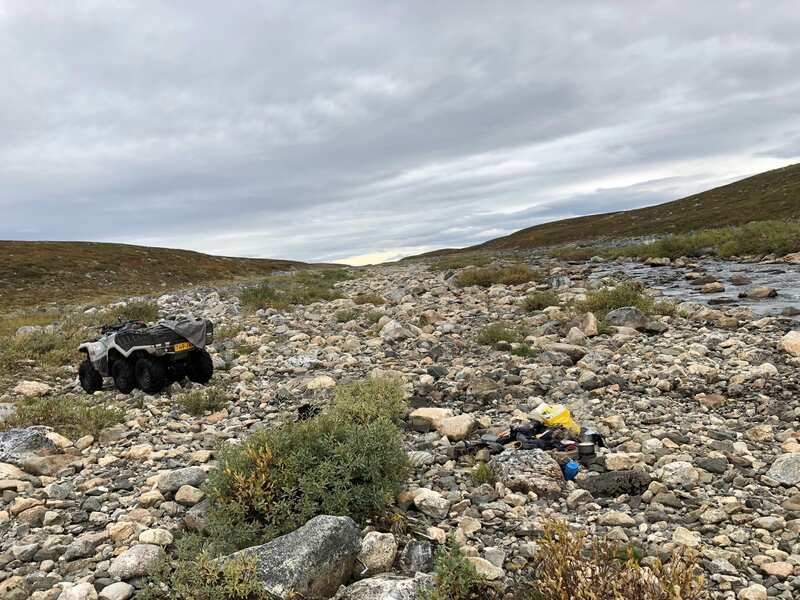 Based on the convening in 2018, I have invited a series of contributions from individuals associated with the Bioart Society’s Kilpisjärvi Biological Station field laboratory artists program to share their experiences and their work in clustered groupings. This entry begins with an interview with Bioart Society Director Erich Berger, in which he discusses the originality, accomplishments, and future plans of the organization—focusing on Field_Notes in particular. Berger points to the development of Field_Notes as the site of community exploration, a gathering that has propelled new ways of considering what bioart can be. Also included in this entry is artist and filmmaker Leena Valkeapää, the Bioart Society’s Ars Bioarctica residency mentor for the Kilpisjarvi Biological Station. Valkeapää introduces her ongoing collaboration with her partner, Oula A. Valkeapää, a reindeer herder in the Sámi tradition, through images of daily life set in the context of their correspondence. During the conference, Valkeapää discussed her research on Sámi reindeer herding and cultural perceptions of time and space, beginning with her initial encounter with then-stranger Oula when she was a long-distance skier and hiker in Lapland. The two met in a hiking hut, where they looked out over a landscape and conversed. To Leena, the landscape appeared very open and absent of human activity, while Oula remarked that there were ever-encroaching signs of activity and development. The piece included here uses some of the methods the Valkeapääs developed in their film Manifestations (2017), where word and image are conjoined in an intensive meditation on being. Using five images and accompanying texts, the Valkeapääs explore the meaning of ordinary objects in their introspective search to understand how time relates to work and the land in each of their lives. Finally, the entry includes a reflection from artist and researcher Saara Hannula, who was a member of the 2018 Field_Notes group “Augury: Machines which look at birds,” hosted by interdisciplinary artist and researcher Martin Howse. Howse’s group undertook artistic investigations of the links between the earth (geophysical phenomena), software/digital tools, and the human psyche (psychogeophysics) in the context of historical and cultural divination practices. Hannula discusses the issues of colonialism in Sámi land. Hannula’s experiences at Field_Notes prompted questions about how artists are situated in lands with which they are largely unfamiliar, particularly with regard to the traditions of local people. In her contribution, Hannula considers how these histories shape artists perceptions and the physical and ecological features of the land. Through these voices, a picture of an organization and its artistic endeavors forms. Though bioart has been primarily associated with lab work, with living things or fragments shown in a gallery context, Bioart Society’s use of the term is more expansive. While this characterization in no way encompasses the full range of artistic interventions in modern life-science and biotechnology, patterns in early bioart did tend to take the forms of gallery installations of lab equipment and aesthetics and street interventions aimed at discussing, for example, food genetics with the public, and performing direct lab interventions.4 Scientific protocols and tools were employed, explored, raided, rewritten, and discarded. In these presentations, modern biology was usually figured as taking place in the lab, which was perceived as something that bioart could help to overcome. Bioart could bring the life sciences into public space, and, therefore, public view. This early period, beginning in the 1990s and mid-2000s, was characterized by an interest in the “amateur.”5 Artists worked to create identities for themselves that allowed for their growing technical expertise while including the public and attempting to make science itself, or at least scientific issues, more accessible to the public through the democratization of lab techniques and conversations. As these ideas developed, some artists, like those involved with Jennifer Willet’s BioARTCAMP at the Banff Centre in Alberta, Canada, have explored biology outside of the lab to great effect. This exploration has usually taken place in the context of “rewilding the lab”—that is, reconnecting the life that biological labs study with the environment, rather than participating in a science-based tradition of field stations or observational fieldwork where specimens are brought back into labs. 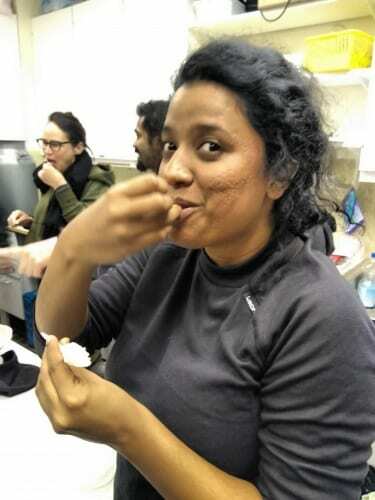 Shruti Sunderraman tastes soil as part of Marc Dusseiller’s HUMUS.Sapiens – Unveiling Hidden Micro Biologies (photograph by Hannah Rogers). The result of two decades of effort in the area of bioart has been the development of extensive laboratory tools in a DIY style, and the expansion of amateur practices around science directed in both pedagogical and creative ways. These advancements influence the way projects come together through the Bioart Society, but the role of environmental experiences through field labs and field station immersions is increasingly central to the way bioart is practiced. Immersion in these contexts offers artists a different dimension, more focused on direct experience and its aesthetic consequences. In the Bioart Society context, lab work is welcomed, but so is creative work with ecology, biology, and other natural sciences, as well as research-based and intuitive environmental projects. This vision of bioart places the networked, interdependent, and evolving nature of the “bio” at the center, leaving the laboratory in favor of the ecosystem. The contributions included in this cluster of entries, framed as “expanding the possibilities of bioart,” will explore new possibilities for what bioart can be through projects that spring from the open inquiry format of the Field_Notes program. Click on the images below to navigate to responses by Erich Berger, Leena Valkeapää, and Saara Hannula. Hannah Star Rogers researches the intersection of art and science, particularly critiques of science in contemporary art. Her publications have appeared in Leonardo, Configurations, The Kenyon Review, and the LA Review of Books. She received an MFA from Columbia University and a PhD from Cornell University in Science and Technology Studies. Her exhibition Making Science Visible: The Photography of Berenice Abbott received an exhibits prize from the British Society for the History of Science and an invited lecture to the Smithsonian Archives of American Art. She is past Director of Research and Collaboration for Arizona State University’s Emerge: Artists and Scientists Redesign the Future. Her current curatorial project Art’s Work in the Age of Biotechnology: Shaping our Genetic Futures will open in fall 2019. She is a visiting scholar in STIS at the University of Edinburgh and teaches at Strathclyde University.